Rapid prototypes took a big step towards realism with the introduction of color. If you think color is no big deal, try watching a black and white television--if you can find one. 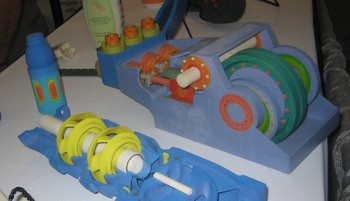 Color models offer several advantages over the drab beige common to rapid prototypes. Parts are easily distinguishable in an assembly and can match the solid model. Analysis results can be mapped onto a model allowing quick visual verification and decrease the likelihood of a critical area being overlooked. Consumer products can be modeled as they would appear on shelves allowing aesthetics to be judged, not just shape. Terrain maps, massing studies, and a host of other applications, will now be able to be modeled more realistically. Z Corporation showed their very impressive color rapid prototype machine recently at PTC/USER World 2006. Z Corp introduced color several years ago and it claims it is still the only company to provide this technology. To create color models, Z Corporation uses a technology similar to color inkjet printers. Its 3D printers build models one cross-section at a time, using liquid binders to solidify layers of powder only .089 mm thick. Multiple print heads mix four colored binders (cyan, magenta, yellow and clear) to create colors of almost any shade. The process repeats until the model is whole model is created. Z Corp's Spectrum Z510 can make models up to 10"x14"x8" and lists at a shade under $50,000.